For most SaaS and software businesses, there are a number of metrics buyers typically look at that can impact valuations significantly. These include revenue, revenue growth, recurring revenue, EBITDA margins, churn, etc. It’s equally important to keep in mind that different industries are valued differently by buyers. For example, software companies are valued using revenue multiples (but usually need to have positive EBITDA to command a premium value). 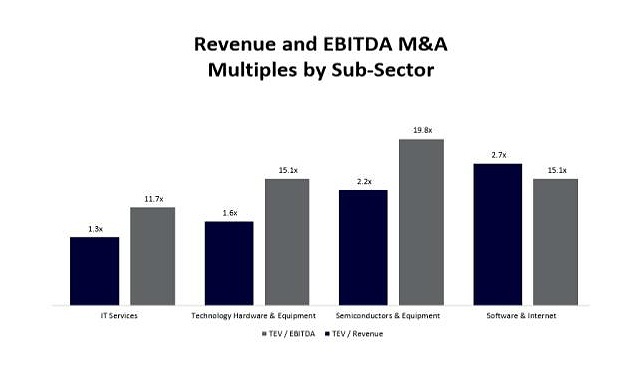 Hardware, Telco, and Semiconductors are valued using EBITDA multiples. And IT Services are valued using EBITDA multiples. The multiples you’re currently seeing are fairly positive relative to previous years, primarily due to a couple of drivers: a strong US economy, lower corporate taxes in the US, low cost of debt, and high public valuations (to name a few). Macroeconomic factors play a significant role in the multiples companies get ascribed and how successful the M&A process will be. If you take a look at the chart below, you’ll see that M&A activity for the software space is extremely strong – 2018 is expected to be one of the biggest years in recent history in terms of # of transactions. Making sure that things on the outside are right for M&A is important, but also making sure your house is in order internally is equally critical. Especially since a potential buyer can approach at any time. Due Diligence: buyers ask for a significant amount of information on the companies they acquire. So being organized around customer contracts, vendor contracts, incorporation, and minute books is very important. When it comes to organizing and sharing important business documentation, virtual data rooms offer both scalability and security, allowing businesses to track and maintain essential business documents. The decision between using a VDR or other cloud-based solutions ultimately depends on your companies needs. When it comes to preparing for the M&A process, choosing a VDR solution not only provides high-level security, but can help your company achieve better results during fundraising rounds, investment cycles, and the management of other investment opportunities. Ed Bryant is the President and CEO of Sampford Advisors, a boutique investment bank focused exclusively on advising clients in the technology sector on Mergers and Acquisitions (M&A).